Julius Erving was caught off guard. He hung in the air, but this time Dr. J wasn’t flying in for another patented slam dunk—he was wondering how the crafty young Clippers forward had gotten past him. One second, the NBA Hall of Famer was rising to swat a shot, the next he was watching the ball swish through the net. That was 30 years ago, but the crafty young forward has never forgotten about the time he beat Doctor J.
I set up perfectly to shoot a skyhook, a Jabbar hook. I could shoot that perfectly. But he knew what I was doing before I did. 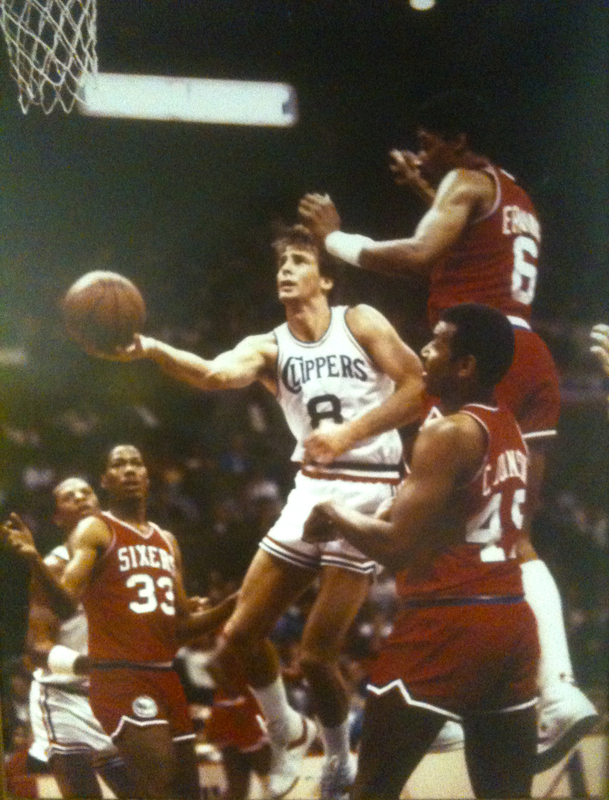 When I turned to shoot I was starting at Julius Erving’s belly button. The ball was already in my right hand to go up, but I pulled that ball back down, spun my body and stuck it out behind him for the layup. It was probably the best move I ever did in the NBA. At 53, Hank McDowell still has a love for the game. He shoots now and then with friends and family, but lately he’s noticed his steps getting slower. Now, the former NBA forward, Memphis Tigers legend, and current Grizzlies radio commentator is getting back into shape with help from the Insanity video exercise program—a series mostly associated with 20- and 30-somethings seeking an intense and challenging workout. The first day, I thought I was going to die. Now I’m in month two, and it’s still hard. It’s one of the hardest things I’ve ever done. But every time I work out I feel better mentally and physically. Part of is is because I’m 53; part of it is because it’s hard. It pushes me, and it pushes my body. I’m dripping sweat when I’m through. Despite his basketball prowess, McDowell is more physically similar to you and me than to LeBron James. At age 30, he required open heart surgery—an aortic valve replacement—thanks to a malfunctioning artery. The malfunction could have killed him. The surgery ended his basketball career (he can no longer participate in heavy contact sports), but it also saved his life. I want to be able to go up and down steps or hike up and down mountains—not just go back and forth to the couch; I want more than that. As I grow older, I don’t want to sit down. I enjoy relaxing, but I don’t want to sit down. The hard part is getting started. The biggest challenge now is, obviously, you are not as flexible. You do need to stretch. I stretch before and after every workout. If all I did was stretch, I’d feel better about myself. I don’t feel like I have to keep up with them [in Insanity]; I do what I can. It’s just about the exercise. As McDowell glances at an old photograph, he thinks about the future. He thinks about hiking through mountains, playing H-O-R-S-E with his kids and how lucky he is to be alive. He thinks about doing another round of Insanity, and he thinks back to that night with Dr. J.